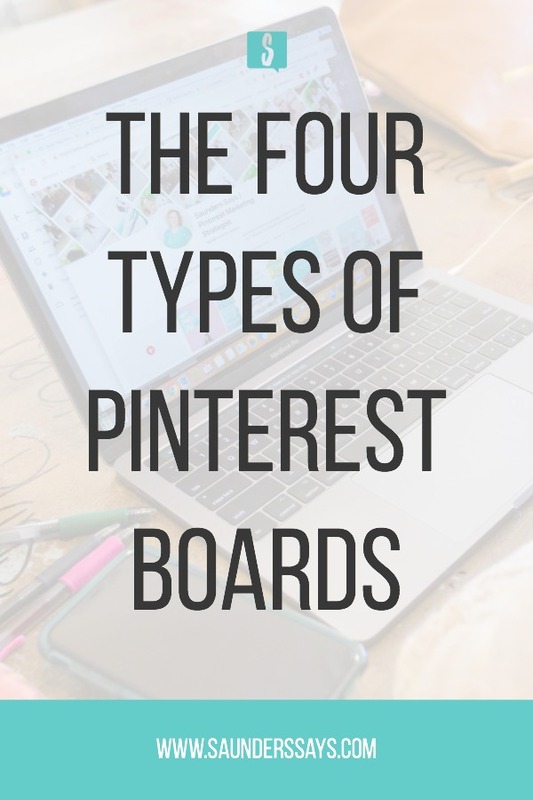 There are four types of Pinterest boards that you can use on your account. All four serve different purposes to the Pinterest user. The four types of Pinterest boards are personal, group, secret, and archived. Since Pinterest was created boards serve as a collection hub for pins. Pinterest boards hold the Pinner’s ideas, inspiration, hopes, and dreams–in forms of home decor, recipes, fashion, and more! This is a gold mine if you are looking at boards from a marketing standpoint. They show you exactly what your ideal client wants to purchase. Wondering if you need cover photos for all these Pinterest boards? Check out my post on Pinterest Cover Photos for Boards now. When Pinterest launched, there were only personal boards. Which meant that if you used Pinterest boards to plan events, such as your wedding, everyone on the platform could see it. Way back then, there was no Smart Feed either and everything was chronological. So, if you’re friend saved 499 pins of bridal bouquets, you would see every single one of those pins. Now personal boards can be both public and secret. This type of Pinterest board is a board that you as the account owner has created and only you can save pins to this board. If you are just starting your journey on the platform, I recommend aiming for a minimum of 10 Pinterest boards that are public. These boards need to showcase your brand and your business. However, as noted in this blog post, 7 Things You Need To Know About Pinterest Boards, there is a sweet spot of boards somewhere between 25-75 boards. Opposite to personal boards, group boards allow multiple Pinners to save ideas. In fact, you might be a contributor on a group board that belongs to another Pinterest user. If you have the time to manage a group board, you can always start your own and invite others to save their pins. Be careful with this if you are new to group boards; you’ll want to make sure your contributors are sharing high-quality content that is on topic and not spamming the board with too many pins. I have scaled back on looking for new group boards to join. This is because group boards just aren’t what they used to be in the past. However, I am still a fan of them if they work for your account and if they are relevant to your niche. If you are looking to join group boards, one thing to note is how many contributors are on the board. If there are a lot, the board will move to fast and your content will get buried. Use data from Tailwind Board Insights before making decisions. Data should always back up whatever you are doing on Pinterest. If group boards are not sending you traffic or not in your niche, don’t continue to waste your time. When leaving group boards, remember to not move too fast. Yall know Pinterest is a moody teenager and if you do too much at once it will get mad. Slow and steady changes are best. Secret Pinterest boards are great for content that is off-brand, not-relevant to your business, or future business ideas. These boards are only seen by you unless it is a secret group board. Secret group boards are just that: secret, but with multiple platform users. I use secret boards for things I don’t want on my Pinterest for Business account. It could be things that aren’t on brand or just personal things like crafts. Another good use of secret boards is content planning. I actually am on a secret group board with two of my business besties and we save blog post ideas there. You can now turn boards from being secret to public and back to secret again. With this, I may turn seasonal boards to secret after a holiday or event. And finally, we have archived Pinterest boards. These are the newest type of boards to the platform. Archived boards basically mean they are secret, but similar content will not be shown in your Smart Feed. Topics from your secret boards may populate your Smart Feed, but this is not the case when you archive a Pinterest board. One thing that archived boards are great for is when you leave a group board, but the board is still showing on your profile. If you archive the board, it will quit showing up as well as similar content from that board. I’ve seen a variety of Pinterest accounts over the last few years. Some people have a lot of archived and secret boards and others have none. When the big trend went around in the summer of 2018 about leaving group boards, I’ve seen leftover remnants from them within some clients’ accounts. So many archived and secret boards, yall. It’s a best practice to keep your public Pinterest boards under 100 total. If you find yourself making board sections so you can keep under this threshold, check out my post on Why You Shouldn’t Use Pinterest Board Sections. As I always remind people, the big thing about Pinterest boards is to NOT delete them. If you are wanting to get rid of a board, make it secret or archive it. Do not delete Pinterest boards because you will lose followers on your account. Trust me. Want to stay up-to-date on the latest about Pinterest boards? Head over to join my free Facebook community now!